This year it will be the turn of our sister town in Germany to visit us. The dates are Friday, September 20, to Tuesday, Septermber 24.
city of Thunder Bay, Ontario, which has close links with Orpington and Orpington Hospital where many soldiers where treated during the course of World War One. who died at the hospital are buried in the churchyard of All Saints' Church, Orpington. After the service a plaque was unveiled at Orpington Hospital. The Mayor of Bromley, Councillor Kim Botting FRSA (pictured left), and the Mayor of Thunder Bay, Councillor Kristen Oliver, signed the agreement marking more than 100 years of friendship which started during World War I and commemorates the sacrifice Canadian soldiers made for freedom. Many are buried in Canadian Corner and in recognition of their heritage, the headstones face west towards Canada. The Mayor of Bromley and President of the Royal British Legion, Orpington, Councillor Kim Botting FRSA said, “I am proud to say that the friendship, which first started during the Great War, continues to this day and we will never forget that the Canadian soldiers made the ultimate sacrifice, with so many more suffering terrible injuries and being treated in our Borough, in Orpington in particular. today’s friendship agreement formalises the relationship between London Borough of Bromley and the Canadian city of Thunder Bay which is based on over 100 years of shared history and remembrance. The venue for 2019 was the Bromley Civic Centre. 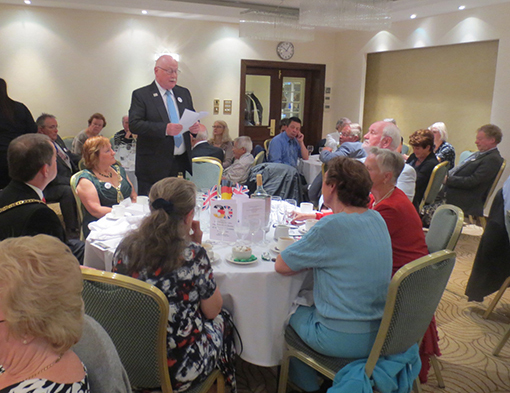 Chairman Peter outlined plans for the coming year and the meeting chairwoman, The Mayor of Bromley, Councillor Kim Botting, stressed the need to increase membership. It is intended we meet informally at 12.30 for lunch. Each person settles their own bill and so just arrive on the day or, if you want a guaranteed seat with the group, phone Joe on 020 8466 5042 or email joeweiss338@gmail.com in advance (not on the day please). Planned lunches are all on Wednesdays. The Stammtisch is for German speaking members who want to practise their conversation, whatever level they are at. It is very informal. Meetings are on the last Saturday of the month at 12 noon in the Orpington Liberal Club. Dates are:April 27; May 25. No need to book. Just turn up. For further information, contact Gerda Loosemore-Reppen on 01689 859225; email g.loosemore@ntlworld.com. The name Stammtisch refers to a table in a German tavern at which the regulars gather. We are sad to report the death of Ute Köhler, widow of the Founder Chairman of the Neuwied Town Twinning Association, Wilhelm Köhler. Since Wilhelm’s death, Ute had not enjoyed good health, and had been living in a nursing home in the Neuwied area. Ute will be remembered with affection by those of us who have been involved in the link with Neuwied since the very early days – always supportive of Wilhelm, always welcoming guests to their home, and who missed him dearly after his death. She died a few weeks short of her 80th birthday. and is survived by her daughter Anette and son-in-law Bert, and by her son-in-law Stefan and his children Fabian and Felix, whose mother Susanne, Ute’s elder daughter, died some years ago. Mike and I thought the journey to Neuwied would be a very long time stuck on the coach. There was an early start, but once on there we seemed to get to Folkestone rather quickly. The coach drove into an extremely tight tunnel, doors closed and nothing seemed to happen. We waited and waited, and still nothing. Then I noticed a square window in the tunnel wall, with lights flashing behind it. Although we couldn’t feel it, we were moving underground! The lads from Park Langley Tennis Club entertained us from the back of the coach with a medley of songs. Then I noticed them getting off the coach, each with his own tennis racket. I couldn’t resist going to see what they were doing. In what looked like a 4.5m by 3.5m space behind the coach, there they were practising their tennis. Bop, bop, bop, bop. That’s dedication! I don’t know whether it was safe though. Then there was an announcement that we had arrived. Ahead of us in the tunnel, the metal central shutter went up, and the glass side doors folded back. We were in France! On Saturday there was a reception in the "Bootshaus." ‘Da Capo’ string quartet performed Nimrod from Elgar’s ‘Enigma Variations." Then they played a lovely piece by Karl Jenkins where the repeated note in the cello bassline sounded like a regular beat, and then a tune Paul McCartney originally called ‘Scrambled Eggs’. Now I personally am an aspiring songwriter, and am studying the works of hit songwriters. Currently I'm learning Skyfall, sung by Adele, on the piano. It has some of the dramatic features of James Bond theme tunes too. So I couldn’t believe it when for their finale, the string quartet struck up with Skyfall. Perhaps it’s what they think of as British! Bromley has given Neuwied some typically British items in the past, including a post box, telephone kiosk and this year… a "REQUEST" bus stop sign. 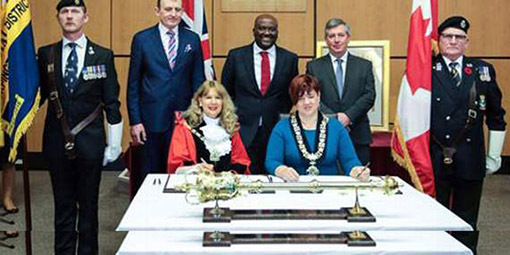 Oberbürgermeister Jan Einig and Mayor Kim Botting signed Neuwied’s "Golden Book" and then a joint declaration affirming the town twinning partnership. Afterwards the coach took us to the Sayner Hütte iron foundry. The symmetrical iron and glass foundry hall was the first industrial hall in the world with a supporting cast iron structure. This construction was later used in railway stations, market halls and Crystal Palace in London. Making cannons, ammunition and iron parts of buildings, it was part of Germany’s military-industrial complex. However, in’ 1818 it started producing filigree iron jewellery and decorative iron castings, known as "Berlin Iron." We saw a great deal of these in the Rheinisches Eisenkunstguss-Museum there. There’s a little park next to the museum and across the park is the Garten der Schmetterlinge, the Butterfly Garden. As soon as I went in there the largest butterfly I’d ever seen flew at my head, and when it opened its wings they were brilliant, technicolour blue. I took a few more steps and realised I was very lucky not to have stepped on the tiny, downy little birds that were running around on the ground. In the evening Mike and I were walking in the centre of Neuwied when we suddenly spotted a bright red telephone box, with shelves inside full of books for loan! On Sunday the coach took us from Neuwied to Koblenz, which literally means"‘confluence," where the two rivers, the Rhine and the Moselle, meet. Then there was a Romantische Rheinreise, a romantic river cruise all the way from Koblenz down to the Loreley and back again. The cruise really was romantic, in the imaginative, emotional and nature-loving sense of that word, as this is the most picturesque part of the Rhine. Steep and very tall banks of grey boulders on both sides were covered with clumps of orange, yellow and green trees. Perched atop these rocks were vertigo-inspiring fairytale castles. It must have been incredibly difficult to even get all the stones up there by hand, let alone build a castle and get it to stay there and not fall all the way down those almost vertical grey rocks! A couple of the castles were fairly near to each other, but separated by a thick grey wall of stone. Apparently these two castles belonged to two brothers, but they kept shooting at each other, so the wall was built to separate them! The turning point of the cruise was the Loreley. She was a beautiful woman who sat atop a steep rock there, combing her golden hair. The sailors would look up, and… crash into the hazardous reefs of the Seven Virgins. In 1824 Heinrich Heine, who was from a Jewish family but later converted to Lutheranism, wrote a poem about this. A few years later Friedrich Silcher set the poem to music, and it became"‘arguably the most famous of German folk songs’. Standing on the deck there, my feet felt the ship give a little shudder, and I realised that the shipwrecks may have had more to do with the treacherous currents underwater there. 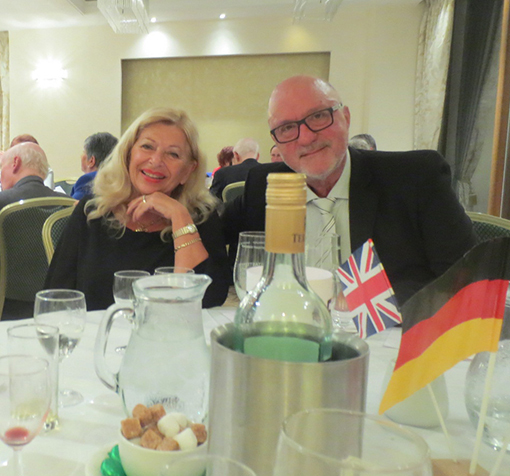 Both the Romantische Rheinreise and the Town Twinning 30th Anniversary Celebrations certainly had the "wow factor.". This turned out to be an excellent event although under the shadow of Brexit. As usual, our Neuwied friends were kindness itself. 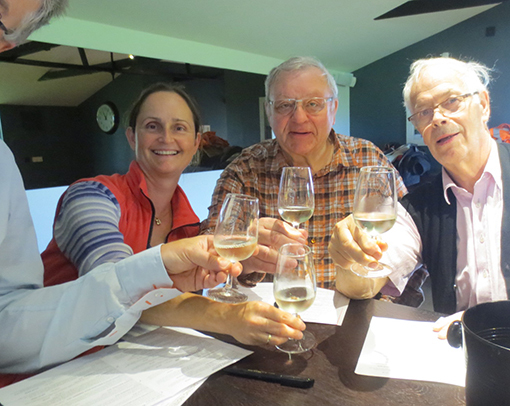 And we met the new Oberbürgermeister Jan Einig and his deputy Michael Mang throughout the weekend. Those travelling by our coach to Neuwied set off at the unearthly time of 6am. The really stunning part of our departure through Eurotunnel was watching how our driver Steve guided his very modern and very long coach into one of the carriages. Yet we didn't incur a scratch. And Steve drove his giant coach through even more challenges during the visit. On the Satruday morning we attended a ceremony at the Bootshaus (Boathouse) on the River Rhine. It soon impressed us just how excellent a successor Jan was to the late Nikolaus Roth, although of different parties. He spoke clearly on how he would not let Brexit destroy our relationship built up over the years. Our Mayor Kim Botting was her usual energetic self, especially when another piece of Bromleyana was added by the Neuwieders to their collection. This time it was in the form of a London bus stop. That follows on the red pillar box in the town centre, the red telephone kiosk – now a miniature street library - and a road sign cheerfully telling us it's 641 kilometres to Bromley. Our Chairman Peter Brown also gave his views. The Bromley Town Twinning Association is, of course, neutral ln party poiitics, but that doesn't stop people giving their own personal views. And Peter, who has devoted a large part of his life to the BTTA, spoke from the heart in both English and German. He told his audience: “For reasons which I personally deeply regret, as do many people, our country is in a very strange and uncomfortable position in Europe – an important member of a very successful union of nation states but yet wanting to cut ourselves off from this union and sever vital trading links, without being able to define what our future relationship will be with a group of countries with whom we have a vast array of historical, cultural and economic connections. Then it was off to see the historical Sayner Hutte Ironworks and go on to the butterfly farm in Bendorf, returning to Neuwied at 4pm. Just two hours more, at 6pm, came a presentation of the Bromley Shield of Honour to Tennis-Club Neuwied at their clubhouse in Niederbieber, followed by an informal evening with entertainment. The honour was to mark the excellent part the tenns club has played in twinning, along with the Park Langley Club. On Sunday, came the most spectacular event of the long weekend. We cruised down the Rhine to the famous Loreley rock, the purported lair of the golden-haired maiden who sent the river's boatmen to their deaths through an enchanted melody. There are, of course, many other historic places along this stretch of the Rhine, which makes our twinning with Neuwied so eventful. For us visitors, the Freundeskreis laid on a banquet meal on the boat. And so another biennial trip passed superbly well. Thank you Freundeskreis. 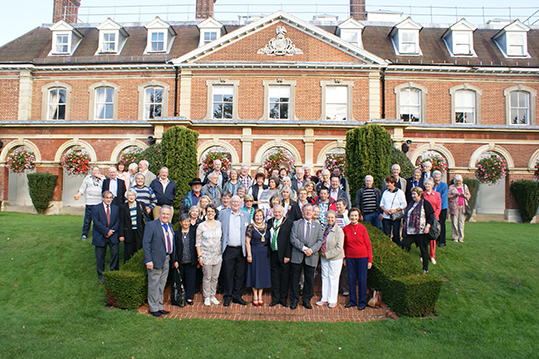 And just to emphasise as always – the Bromley Town Twinning Association is independent of Bromley Council and we finance ourselves almost entirely by our own voluntary fundraising. Members dug deep into their own pockets to go to Neuwied. The Mayor of Bromley, Councillor Kathy Bance MBE, chaired the meeting. She said that when she became Mayor she had known only a little about the twinning, but then came the sudden death of Nikolaus Roth, Lord Mayor of Neuwied, and she attended his funeral on behalf of the London Borough of Bromley. She was given a warm welcome and taken on a whistle-stop tour of Neuwied. She later received an invitation to the installation of the new Lord Mayor, Jan Einig, and attended on behalf of the Borough. Once again she was impressed by the hospitality and welcome she received. She thought that Neuwied was a beautiful town and she expressed the hope that the partnership would continue to grow during the next 30 years. Mr Einig had suggested that there should be greater interaction with Bromley and more exchanges. 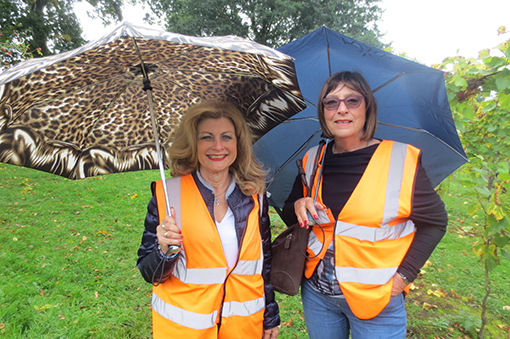 One thought she offered was that Neuwied has a golf course/club and she wondered whether there was the possibility of a partnership with one of the many golf clubs in Bromley – how about a possible golf match in Neuwied next year? Chairman Peter Brown reported on a good 30th anniversary year, with the highlights being the September visit by the group from the Neuwied association, of which the main events were the Sunday outing to the Kentish countryside (Chapel Down vineyard, Tenterden, and steam railway to Bodiam with cream tea), a concert given by BYMT Adult Choir in memory of the late Lord Mayor of Neuwied Nikolaus Roth, and the Gala Dinner. He paid tribute to the work of Peggie Bensaid over many years. Peggie had now stepped down from the committee and the meeting agreed unanimously that she be granted Honorary Life Membership. The Chairman also paid tribute to Peter Woods, retiring Vice-Chairman, for his many years of service as Mayor, Councillor, committee member and Vice-Chairman. He thanked committee members for their support, and Richard Redden for his work on our newsletter and website, in particular for the special 30th anniversary edition of the newsletter. He concluded by stressing the continuing needs to be addressed – to maintain contact with schools, to recruit new members whilst reducing our age profile, and to raise public awareness about us. Treasurer Arthur Wilkinson presented the accounts for 2017. He reported that there was a deficit in 2017 of £1,759.87 compared to a revenue surplus of £2,698.49 in 2016. The balance of funds at the bank reduced during the year from £5,292.96 to £3,765.32. This was consistent with the cyclical nature of the Association's accounts. 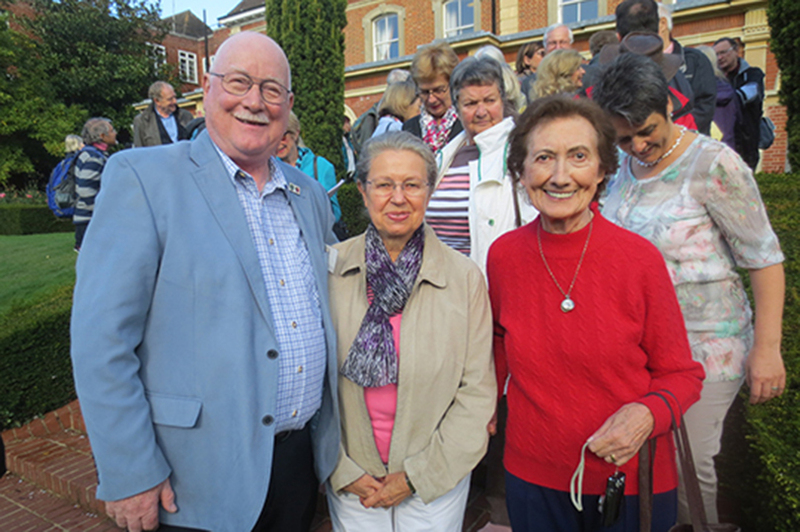 We entertained our Neuwied friends in Bromley in 2017 and the net cost of the visit was within the £3,000 budget which was the committee's estimate. In 2018, with Bromley visiting Neuwied and a programme of fund-raising events in prospect, a return to surplus can be expected. Membership secretary Jane Beckley reported that current paid-up membership totalled 65, made up of 36 single, 28 family, 1 group, plus 5 honorary life members, but should increase to 80 once all outstanding subscriptions had been received. Peter Brown, Chairman; Jane Beckley, Vice-Chairman; Secretary, Helen Gibbons; Treasurer, Arthur Wilkinson. Management Committee members: Ruth Bennett, Sheila Brown, Norma Classen, Jane Harding, Julia Knox, David Noble; Ralph Skelton, Joe Weiss. Council Members currently nominated to serve on the Management Committee are Councillor Ruth Bennett, Councillor Kim Botting and Councillor Mary Cooke. Mrs Bennett will be standing down from the council in the forthcoming local elections in May.